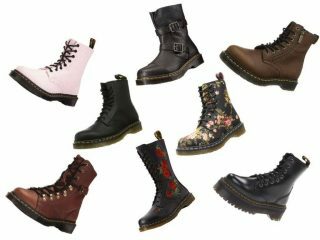 Now we are going to look at 8 mid-calf boots from Dr. Martens but first let’s acquaint with the well-known British brand Dr. Martens, named after its founder. It has made a revolution in the manufacture of footwear. Dr. Martens is by right considered the best orthopedic footwear worldwide. A feeling of safety is the one everyone is looking for. Wearing any model of Dr. Martens it is easy to feel safe as boots of this producer aren’t afraid of the negative influence of acids, petrol or oils. Thanks to such a great innovation as an air-cushioned sole, any pair of shoes allows enjoying an incomparable feeling of comfort as if it was made especially for you. This Vonda lace-up boot is an embodiment of punk-princess style. This model can be associated with a rock star image in a combination with short leather skirt. It is by right considered the best choice for bright personalities who want to stand out. This lightweight full-grain leather pair of boots looks not only solid and comfortable but also very feminine thanks to the appliqued red roses on it. Vonda mid-calf casual boots combine classic style of Dr. Martens brand with the romantic flower embroidery, thick trodden soles with signature yellow stitching and full-length lace-ups. According to women who have already got Vonda pair of shoes, it is possible to rely on it, regardless weather conditions. The model is very comfortable and suitable for the everyday walks. There is nothing perfect in this world but Dr. Martens classic style 8 eye boot from greasy leather seems to be an exception from this rule. Moreover, both women and men can become the lucky owners of this pair of boots as it is unisex. Matte black with a waxy feel, grooved sidewalls, heel loops, yellow stitching makes this model look an icon of style, which will fit both formal occasion and some cool party. It fits well and provides an opportunity to enjoy comfort thanks to AirWair sole. The Jadon 8-Eye Boot from the famous brand has definitely some retro touch. This is one of the most popular models due to its smooth upper leather and metal hardware. Sure that all distinctive features of Dr. Martens footwear are present here. Air cushion sole along with the breathability provided with a soft fabric allows enjoying even long walks on foot. Thanks to heat-sealing and slip resistance the Jadon Women’s Boot is a good option to choose. By the way, this model has a PVC platform, which adds height and can serve a great helper to those women who want look higher. The model fits its size and never lets down regardless weather conditions. Despite the fact that it looks really tough, it is lightweight and easy-to-wear. This model is a combination of hiker style and grunge. Dr. Martens coralline combat boot is a perfect choice for women who want to look stylish giving preference to the top-quality comfortable footwear that is resistant to any weather conditions. Air-cushioned soles make this pair of boots very durable as well as the fact that upper and sole are heat-sealed and sewn together. Sure that such iconic features as yellow stitching and heel loop are present here as well. Dark brown boot from Dr. Martens is popular among women thanks to its leather quality with the subtle grained finish. Here one can notice the reinvented classic style of Dr. Martens Pascal 8-eye boot, however, this model has top quality textured leather plus a zip on the outside, which is really very convenient to use. All major features of Dr. Martens footwear are here as well: upper and sole are sewn together, good abrasion, slip resistance and sure an air-cushioned sole. It is not possible not to fall in love with the Women’s Pascal with Zip Combat boot. It is a perfect choice that has the right to be in a wardrobe of each woman due to its versatility and iconic styling of the famous brand. The base idea of Kristy boot was a classic Engineer boot. The pair of Martens in Black Virginia has an open look of the two-strap, which makes it suitable both for beautiful light dress and image with jeans. This model is a must-have pair of boots as it is both stylish and reliable. Relaxed casual style and black color make it even more stylish. Soft Virginia leather and metal buckles together with the tonal stitching make this model one of the most popular among women who prefer the rugged styling. There are no doubts that it can resist bad weather conditions as it is provided with the oil-and-fat-resistance and slip resistance. This textile page boot is a great combination of all iconic brand features like yellow stitching, heel tab, air-cushioned sole and completely new lovely style. All women who love Dr. Martens brand will appreciate this feminine lightweight pair of boots for everyday walks. Upper waffle cotton makes it look very accurately. Moreover, it not only looks great but functions as well: the textile lining is breathable. Page boot from Dr. Martens has all chances to become the favorite pair of footwear in the wardrobe of any lady who cares about comfort. This Vintage Rose Dr. Martens 1460 8 – Eye Boot is the great choice for the autumn season, especially taking into account that there is a floral print on it, which is very fashionable today. The classic fabric 8-eye model from Dr. Martens has become much more feminine thanks to the print with roses. However, it is not the crucial criterion why this model is worth choosing as there are more other benefits the producer offers. Oil-and fat-resistant pair of boots makes it possible to wear it anytime as there are no such weather conditions that may prevent from the comfortable walk outside wearing the lace-up boot with slip resistance. This pair of boots is very popular due to its high-quality and durability, which is chosen by both girls and older women who want to have reliable boots and outline their sense of style at the same time. We selected two leaders: Dr. Martens Women’s 14-Eye Vonda Casual Boot and Dr. Martens 1460 8 Eye Boot. In general, all models of the legendary brand Dr. Martens are really great. All of them have innovative features that make them durable and reliable. It is extremely difficult to choose the leader among Dr. Martens mid-calf boots as all of them to have air-cushioned sole, slip resistance, breathability, solid construction, good abrasion and yellow stitching. There are many models able to meet all wants and needs. Even the choosiest lady will be able to find her perfect match as there is a wide range of both leather and fabric boots, either with prints or smooth. The sole of the boot must be quite stiff and serve as a shock absorber, and the heel must be wide. It is not necessary to choose tight boots, even if the model is very beautiful. This threatens the formation of calluses, skin hardening, and corns. More spacious boots a person needs in order to reduce the load from the thumb, which when walking moves forward about half a centimeter. It is much better to give preference to boots made of leather or natural fabric so that the foot can breathe. Be sure to evaluate the quality and strength of fasteners and fittings, because these elements determine the durability of the footwear. Classic black calf boots are the most popular kind of footwear that must be present in the wardrobe of every fashionista. What to wear calf boots with? Nowadays calf boots have become really popular must-have footwear due to their versatility and practical look for every day. It is possible to wear calf boots almost with everything. Such models look stylish either with skinny jeans or boyfriends that add some relaxed touch to the styling. Dr. Martens tough boots with floral prints look perfect with the lovely feminine dresses. It is recommended to give preference to short dresses in order to elongate legs visually when it is combined with mid-calf boots. How to care for calf boots? Even top-notch quality boots may have the shorter lifespan without appropriate care. It is necessary to care about boots taking into account their outer material. There are a lot of special balsams, protectors, and cleaners available for all types of natural materials. It is well-known that footwear produced by Dr. Martens is famous for its durability but it doesn’t mean that no proper care is required. There are some useful recommendations that will help to make Dr. Martens boots serve for years. Every day after the walk it is necessary to remove dirt with a soft cloth, then using the soapy water for cleaning soles. It must become a habit to clean laces. Some may recommend using acetone-free nail polish remover to get rid of scuffs if there are any but it better uses special cleaners offered by the producer. It is necessary to remember that rubbing too hard is impossible, otherwise, the finish can be damaged. One more thing to keep in mind when wearing leather boots is that it requires moisturizing in the order it doesn’t dry or cracks for the longer period of time. This function is well-performed by the special Wonder Balsam, which contains all necessary components able to protect boots from the water. Wax-based polishes are good for taking care of leather. It is necessary to choose a polish close to the color of boots or the neutral one. With a special polish and shoe brush, high-quality boots made of premium materials may work for many years.